Population dynamics of small pelagic fishes (SPF) and their management in Japan were reviewed for Japanese sardine Sardinops melanostictus, Japanese anchovy Engraulis japonicus, chub mackerel Scomber japonicus, and Pacific saury Cololabis saira. The catch and biomass of SPF generally showed decadal-scale variability with prominent species replacements since the 1900s. The causes of species replacements were generally associated with climatic/oceanic variability, particularly “regime shifts,” of which the 1988/89 regime shift was the most influential since the 1970s. Variability in the early survival rate is a key factor for population fluctuations, and the proposed hypothetical mechanisms of recruitment variability are summarized herein. Although overfishing during the 1990s and early 2000s prevented the recovery of Pacific stocks of sardine and chub mackerel, they have been recovering since the mid-2000s owing to strong year classes and reduced exploitation rates. The fundamental cause of overfishing was derived from a mismatch between investments in larger purse seine fleets during the 1980s and poor ocean productivity since the 1988/89 regime shift, when dominant SPF began to shift from sardine to anchovy. Recommendations for fisheries management of SPF around the Japanese Archipelago are proposed, considering climate change and naturally and drastically changing SPF populations. Published with support by the Japan Society for the Promotion of Science (JSPS) KAKENHI Grant no. JP 262003. Population dynamics and Japan’s fishery management of the principal small pelagic fishes (SPF) around the Japanese Archipelago were reviewed on the basis of available information, including long-term trajectories of commercial catch, biomass, spawning stock biomass (SSB), recruitment, recruitment per spawning stock biomass (RPS, No./kg), fishing mortality coefficient (F), and exploitation rate (ER, catch weight/biomass). Potential mechanisms of population fluctuations of target SPF including the effects of “regime shifts” (Kawasaki 2013) and climate change were also summarized. Finally, recommendations for fisheries management of SPF around the Japanese Archipelago were proposed. The target stocks reviewed are the Pacific and Tsushima Current stocks of Japanese sardine Sardinops melanostictus and chub mackerel Scomber japonicus; the Pacific, Seto Inland Sea, and Tsushima Current stocks of Japanese anchovy Engraulis japonicus; and Pacific saury Cololabis saira, which is considered the only stock over the North Pacific Ocean and its marginal seas (Table 1, Fig. 1). Table 2 describes the abbreviations, mathematical constants, and biological reference points for fisheries management used herein. Summary of ecological characteristics of target stocks. Jan.–May in central and southern East China Sea, Mar.–Jun. in western Kyushu and San-in district. Decadal-scale variability in catch trajectories of SPF (Fig. 2), accompanied by shifts in dominant species, is often linked to global- or basin-scale variability in environmental factors; a famous example is the sardine/anchovy cycle associated with the Pacific Decadal Oscillation index (Chavez et al. 2003). Decadal-scale alternation in the dominant species is known as “species replacements” (Matsuda et al. 1992; Barange et al. 2009). Species replacements can also be detected by analyzing the stomach contents of minke whales Balaenoptera acutorostrata (Fig. 3), which is an opportunistic feeder, and predatory fishes (Tamura et al. 1998; Yatsu et al. 2003). 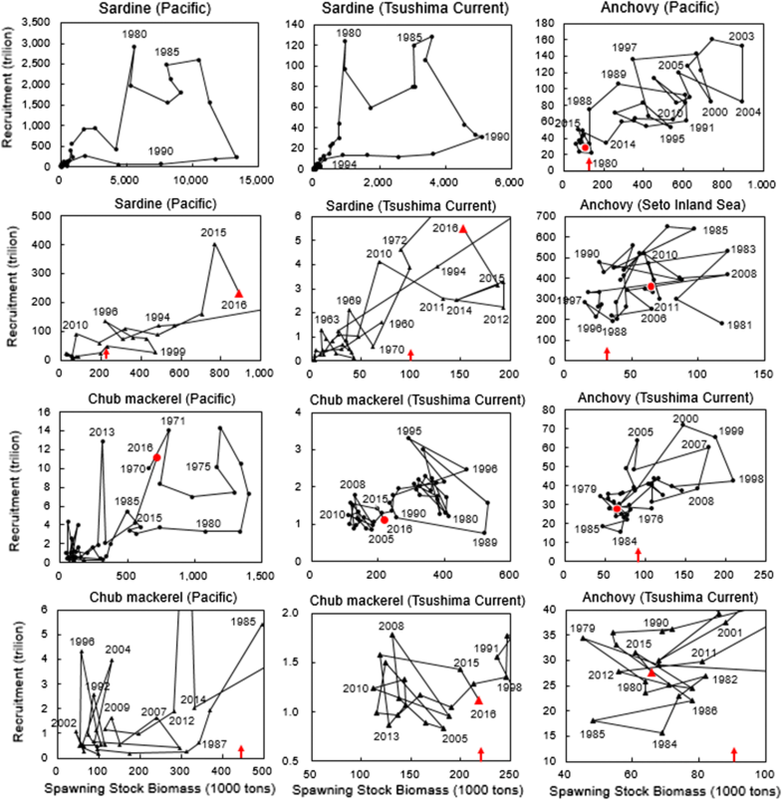 As catch trajectories of jack mackerel Trachurus japonicus and common squid Todarodes pacificus showed decadal-scale variability similar to that of Japanese anchovy (Yatsu et al. 2005; Gong and Suh 2012), these species were excluded from this review. Although the trophic level of chub mackerel is higher than that of other SPF, as it preys on anchovy in addition to zooplankton (Table 1), this species was included in this review for three seasons. First, its longevity, natural mortality rate, and migration routes are similar to those of sardine (Table 1). Second, the principal prey of its larvae and juveniles (copepod nauplii) is similar to that of other SPF (Table 1). Third, this species has been often regarded to replace SPF and is one of the major target species of purse seine fishery, which suggests its high potential biomass and commercial catch in spite of its higher trophic level (Fig. 2; Matsuda et al. 1992; Takasuka et al. 2008a; Kawasaki 2013). The Northwestern Pacific Ocean (FAO Statistical Area 61) is the most productive area worldwide, comprising oceanic waters where interactions of western boundary currents (the Tsushima, Kuroshio, Kuroshio Extension, and Oyashio Currents) create zones of enrichment and concentration of biological processes, as well as marginal seas (the East China Sea, Yellow Sea, Japan Sea, Seto Inland Sea, and Sea of Okhotsk) with broad continental shelves (Fig. 1; Yatsu and Ye 2011). The net primary productivity is extremely high in the East China Sea, Yellow Sea, and Seto Inland Sea because of high nutrient supply from shallow sea floor and river discharge (Table 3). Among oceanic areas, Kuroshio (a subtropical area, including the Kuroshio Extension and Kuroshio recirculation area) is the least productive, mainly due to a strong stratification of the water column (Chiba et al. 2008), whereas the productivity in other areas is similar. The net primary productivity of Oyashio and Okhotsk Seas (subarctic areas) is high during spring and summer, unlike other areas where the maximum productivity occurs in spring. Furthermore, the ratio of seasonal maximum/minimum productivity in the subarctic area is much higher than that in other areas around Japan (Table 3), which is consistent with the findings of Brown et al. (2014). As the Japanese Archipelago extends from subtropical to subarctic zones, it serves various types of habitat and accommodates rich marine flora and fauna associated with these zones, accompanied by pronounced seasonality in the ecosystems (Figs. 1, 4). The East China Sea and Yellow Sea have undergone drastic changes during recent decades as witnessed by species shifts, increasing blooms of harmful algae (red tide) and jellyfish, and eutrophication, suggesting that the ecosystem structure is rapidly shifting (Yoo et al. 2010). Harmful algae and/or jellyfish blooms are also common in the Japan Sea, Seto Inland Sea, and semi-closed bays in Japan, where anthropogenic effects are prominent (Trainer and Yoshida 2014; Uye and Brodeur 2017). Moreover, the annual average sea surface temperature (SST) around Japan has increased by +1.11 °C over the last 100 years, which exceeds the corresponding figure for the global ocean and the North Pacific (+0.54 °C and +0.51 °C, respectively) according to the Japan Meteorological Agency (JMA) (JMAWeb: https://www.data.jma.go.jp/gmd/kaiyou/english/long_term_sst_japan/sea_surface_temperature_around_japan.html Accessed 15 Oct 2018). This warming affects marine ecosystems and SPF around Japan and its adjacent countries (Yoo et al. 2010; Yatsu et al. 2013). SPF are short-lived and fast-growing, and are characterized by high and often variable levels of natural mortality, resulting in the dependence of their stock size on recruitment (Barange et al. 2009). Recruitment is generally highly variable in response to complex trophodynamics, maternal effects, and environmental factors such as changes in temperature and prey availability (Houde 2008; Aoki et al. 2018). Spawning of the target SPF around Japan generally takes place in subtropical waters such as the Tsushima and Kuroshio Currents and the Kuroshio Extension, where small zooplankton, including copepod nauplii, are numerically abundant, thus playing an important role as a prey for the larvae and juveniles of the target SPF (Table 1, Fig. 4; Chiba et al. 2008). The spawning season generally extends from winter to spring, except for anchovy, whose spawning period extends from spring to autumn. Meanwhile, subarctic waters such as the Oyashio Current and Yellow Sea, and the northern areas of the Japan Sea and East China Sea are important feeding grounds for SPF during summer and autumn. Here, the SST becomes suitable for SPF, and large-sized zooplankton such as Euphausia pacifica, Neocalanus spp., and Calanus sinicus become available during these seasons (Fig. 4; Sugisaki and Kurita 2004; Yoo et al. 2010). The transitional regions between subtropical and subarctic waters including the Kuroshio–Oyashio Transition Zone (KOTZ) are also important feeding grounds for both the adults and juveniles of SPF. Particularly during spring, abundant small neritic copepods such as Paracalanus parvus are available in the KOTZ, owing to the spring bloom and entrainment of coastal waters by the Kuroshio and Kuroshio Extension Currents (Table 1; Takagi et al. 2009). Therefore, the life history and migration of SPF are associated with seasonal changes in temperature and prey availability around the Japanese Archipelago. SPF are important for worldwide fisheries and marine ecosystems, owing to their abundance and intensive consumption by various marine predators (Barange et al. 2009; Checkley et al. 2017). SPF are indispensable for food security in developing countries, while in developed countries, SPF are largely processed into fish meal and fish oil. In Japan, the principal SPF fishery uses purse seining (Makino 2018), and various other methods are also used. Fishing grounds are located almost entirely in coastal and offshore areas around Japan. The target species of the Japanese purse seine fishery are generally Japanese sardine, Japanese anchovy, chub mackerel, spotted mackerel Scomber australasicus, jack mackerel, common squid, and skipjack tuna Katsuwonus pelamis. This fishery changes the target species by season and area, depending on availability and commercial demands of potential target species, under designated management restrictions. In Japan, chub and spotted mackerels fetch a high market price and are used mainly for human consumption, while sardine and anchovy are inexpensive and mainly used for human consumption and animal feed (Makino 2018). The Japanese catch of Pacific saury is almost exclusively derived from the stick-held dip net fishery, mainly in waters from the eastern area of Hokkaido Island to the Kanto area of Honshu Island during its southwestward spawning migration from August to December (Fig. 1). Large saury draws a high market price and is used for human consumption, whereas small-sized saury and mackerels are inexpensive and used in a manner similar to that of sardine and anchovy. It must be noted that the market price of juveniles (“shirasu” or whitebait) of sardine and anchovy is high, as this is a traditional and popular Japanese food. In the Pacific Ocean, Pacific saury fishing grounds belonging to Japan and Russia are generally located within their exclusive economic zone (EEZ), whereas China, South Korea, and Taiwan harvest this species in international waters (Suyama et al. 2016), i.e., the Convention area of the North Pacific Fisheries Commission (NPFC). This was formally established in 2015, and is responsible for stock assessment and management of commercially important species and the surrounding ecosystems (with the exception of tunas and salmons, for which other international organizations are responsible; Yatsu and Ye 2011). The pacific stocks of Japanese sardine and chub mackerel were also harvested by Russia for a long period when their stock was abundant, and China recently began to catch them just outside the Japan’s EEZ near Hokkaido Island. In the Japan Sea, East China Sea, and Yellow Sea, the distribution, population structure, and migration of SPF, including the Tsushima Current stocks of Japanese sardine, anchovy, and chub mackerel, are not well known, particularly in the waters of China (for details, see descriptions of these stocks in later sections). Six climatic and oceanic environmental indices have been reported to affect the dynamics of target stocks included in this review (Fig. 5), namely, the North Pacific index in winter (NPI; Trenberth and Hurrell 1994), Pacific Decadal Oscillation index in winter (PDO; Mantua et al. 1997), SST of the Kuroshio Extension South Area in February (KESA; Fig. 1; Noto and Yasuda 1999), North Pacific Gyre Oscillation index in winter (NPGO; Di Lorenzo et al. 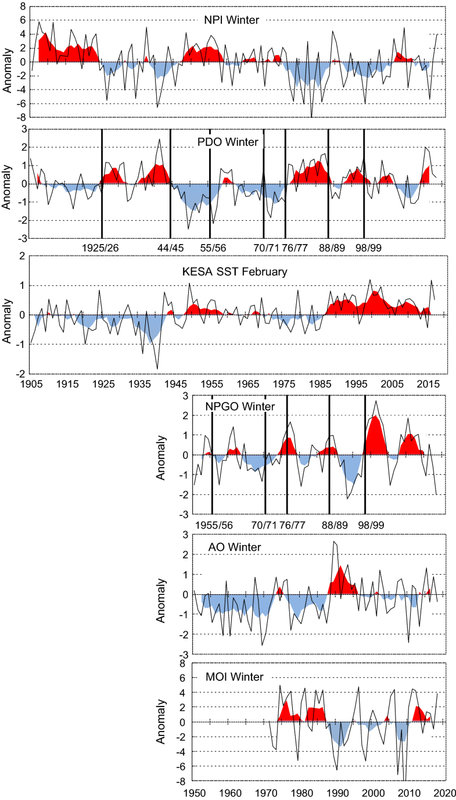 2008), Arctic Oscillation index in winter (AO; Thompson and Wallace 1998), and Monsoon index in winter (MOI; Hanawa et al. 1988). The NPI in winter is linked to winter activity of the Aleutian Low, which affects subarctic circulation, Kuroshio Current transport, and oceanic states in the Central North Pacific, as well as the anomalies of basin-scale (PDO and NPGO) and regional SST, mixed layer depth (MLD), upwelling, and productivity of lower trophic ecosystems. It may also affect the probability of encountering predators of SPF (Yatsu et al. 2008; Di Lorenzo et al. 2013). The PDO and NPGO are the first and second modes of empirical orthogonal function (EOF) analysis of detrended SST in the North Pacific Ocean (north of 20°N), respectively. The variability of NPGO has been greater than that of PDO since the 1990s (Fig. 5; Di Lorenzo et al. 2008). The AO is the first mode of EOF analysis of monthly anomalies in sea-level pressure in the Northern Hemisphere, north of 20°N. The MOI is the December–February average difference in sea-level air pressure between Irkutsk (Russia) and Nemuro (eastern area of Hokkaido Island). In the positive phase of PDO, the SST in the Northwestern and Central North Pacific Ocean, approximately between 30°N and 50°N, becomes cooler, while the SST in coastal and offshore areas of North America becomes warmer (Mantua et al. 1997). In the positive phase of NPGO, the SST of the Northwestern and Central North Pacific Ocean becomes warmer south of approximately 40°N, while the SST becomes cooler in waters north of approximately 40°N and the entire area of the Northeastern North Pacific Ocean (Di Lorenzo et al. 2008). The PDO- and NPGO-derived Rossby waves drive changes in the meridional position and strength of the Kuroshio Oyashio Extension Currents (KOE), respectively, with a lag of 2–3 years; in the positive phases of PDO and NPGO, the KOE shifts south and intensifies (Di Lorenzo et al. 2013). During the negative phase of AO, the cold Arctic air slides south into the Northern Hemisphere, causing cold winter temperatures around Japan. In the positive phase of MOI, strong NW winds prevail in winter, enhancing vertical mixing of the water column and reducing the SST. The winter KESA SST can be regarded as a proxy of winter MLD and SST near the axes of the Kuroshio and Kuroshio Extension Currents (Nishikawa et al. 2011), where the eggs and larvae of the Pacific stocks of Japanese sardine, Japanese anchovy, chub mackerel, and Pacific saury are distributed (Table 1). Anomalies in the SST at the spawning and nursery grounds are important as they primarily influence the survival rate of eggs, growth rates, and physiological conditions of larvae after hatching (Takasuka et al. 2008b). Variability of MLD is also important for nutrient supply from deeper layers during winter, and it affects the primary productivity (Chiba et al. 2008). During the 20th century, the Pacific populations of sardines flourished during periods of warmer-than-average global air temperatures and positive phases of the PDO index, whereas anchovies flourished during the negative PDO phases (Figs. 2 and 5; Kawasaki and Omori 1988; Chavez et al. 2003). Thus, synchronized sardine/anchovy cycles coupled with global or basin-scale climatic/oceanographic jumps or shifts lead to the concept of “regime shift” (Kawasaki 1983, 2013; Lluch-Belda et al. 1989). Kuwae et al. (2017) demonstrated that the Japanese sardine scale deposition rate (SDR) over the last 2850 years, obtained from Beppu Bay, Southern Japan (Fig. 1) indicated periodicities at approximately 50, 100, and 300 years, whereas the SDR variations in Japanese anchovy showed periodicities at approximately 30 and 260 years. This finding indicates that the decadal-scale alternations in the sardine and anchovy populations observed in the 20th century did not necessarily occur during earlier periods. This is consistent with the results described by Baumgartner et al. (1992), who estimated variability in the abundance of sardine and anchovy based on SDR from 270 A.D. obtained from the Santa Barbara Basin off California. In the same study, spectral analysis of the SDR indicated that sardine and anchovy both tended to vary over a period of approximately 60 years, and anchovy also fluctuated at a period of approximately 100 years. Kuwae et al. (2017) also reported that since the late 15th century, the SDR variability nearly coincided with good/poor cycles in Japanese archives of catch records obtained from the Kanto area of Honshu Island to the northeast of Kyushu Island. Kuwae et al. (2017) detected a multicentennial coherency in the variability of sardine abundance with variability in the abnormal snow index in East Asia and in reconstructed PDO. This coherency is consistent with the findings of Checkley et al. (2017), who concluded that sardine and anchovy populations are primarily controlled by climate variability (bottom-up factors), and secondarily by top-down and intrinsic traits of the species. However, the effects of fishing since the 1950s cannot be ignored, and the biological mechanisms linking climate/ocean variability to population dynamics of SPF are still unresolved. The mechanisms may vary with species/stock, oceanographic/biological processes, and ocean regimes (Lindegren et al. 2013; Checkley et al. 2017; Kaneko et al. 2018; Takasuka 2018). The spatial distribution of SPF drastically changes in response to stock fluctuations, but it differs with area. In the western boundary current areas such as the Kuroshio and Oyashio Currents, the spatial distribution expands principally toward open ocean close to or beyond the international dateline, and northward and southward during high stock periods. Contrastingly, in the eastern boundary current areas such as the California and Humboldt Currents, which are characterized by upwelling ecosystems, they expand principally poleward along the coastal and offshore zones (Schwartzlose et al. 1999; Checkley et al. 2017). In addition, the somatic growth and maturation of SPF are affected by stock abundance (Table 1). The management of SPF is a challenge as the recruitment and surplus production are strongly affected by environmental variability, including regime shifts (Lluch-Belda et al. 1989; Aoki et al. 2018). It must be noted that although collapses of SPF are often attributed to either overfishing or natural environmental fluctuations, they are not mutually exclusive (MacCall 2009). Until 1996, Japan’s management of SPF fisheries was carried out by means of input-control and technical measures, such as limitations on the number and size of fishing vessels and time/area closure of fishing grounds (Ohshimo and Yamakawa 2018). However, there was no limitation on the individual body size of stocks. One reason for this may be Japanese traditional food culture, which utilizes “shirasu” or whitebait of sardine and anchovy for human consumption. In 1997, the Fisheries Agency of Japan (FAJ) introduced a total allowable catch (TAC) system for seven species including sardine, chub mackerel (combined with sympatric spotted mackerel), and Pacific saury, besides the existing management measures in order to prevent growth and recruitment overfishing (Makino 2018; Ohshimo and Yamakawa 2018). Since then, allowable biological catches (ABCs) are proposed every year for each stock by the Fisheries Research and Education Agency (FRA) (FRAWeb: http://abchan.fra.go.jp/index1.html Accessed 18 Oct 2018). Furthermore, in 2001, the FAJ introduced the Resource Recovery Plan system, based essentially on the Japanese fisheries co-management concept (Makino 2018). As such, the FAJ has intensified the management of SPF over the last two decades. The overall status of Japanese fisheries relative to fisheries around the world has been described by Ichinokawa et al. (2017). In 2004, the FAJ and FRA revised the ABC determination rule or harvest control rule (HCR), where the maximum sustainable yield (MSY) was not explicitly designated as a management objective (Ichinokawa et al. 2017; Ichinokawa and Watanabe 2018; Ohshimo and Yamakawa 2018). Since 2004, the MSY has been interpreted in Japan as a yield that would be gained over a certain period by a management scheme with appropriate HCRs (Ohshimo and Yamakawa 2018). As a biological reference point of SSB to avoid recruitment overfishing, the concept of Blimit was applied for each stock, whenever sufficient data were available. Blimit is empirically defined as a threshold of SSB, below which poor recruitments are anticipated. Therefore, Flimit (a biologically allowable limit reference point of F such as Fmsy and Fmed; Table 2) and Ftarget (a precautionary reference point of Flimit) must be reduced to ensure the recovery of SSB, if the current SSB is below Blimit. If the SSB is below Bban, a fishing moratorium or other measures to ensure a similar effect must be imposed. The historically lowest SSB in the two stocks of Japanese sardine has been designated as Bban, which is equivalent to Bloss. Although multiple ABCs corresponding to different management objectives and scenarios have been proposed as candidates for TAC, precautionary ABCs have never been adopted in Japan. As such, Japan’s HCRs are considerably different from those used in the EU, USA, and regional fisheries management organizations (Ichinokawa et al. 2017; Ichinokawa and Watanabe 2018). In 2018, the FAJ changed its fisheries management policy by adopting the MSY as an explicit target of management. Debates are ongoing among stakeholders regarding this policy change, mainly from two viewpoints (Ichinokawa and Watanabe 2018). First, the MSY is uniquely determined, but nature is not so simple, especially in the face of naturally and drastically changing populations of SPF. Second, the MSY theory is easily understandable for broad stakeholders, but the MSY does not allow stakeholders to select the most desirable objective, which would be biologically and/or socio-economically determined through debates and consensus among stakeholders. I used long-term data of annual Japanese commercial catch of the target species (Fig. 2) and the stock-specific data on biomass, recruitment, SSB, RPS, F, and ER, adopted from the most recent Japanese stock assessment reports (Figs. 6, 7), according to Furuichi et al. (2018), Hayashi et al. (2018), Kamimura et al. (2018), Kurota et al. (2018), Kohno and Takahashi (2018), Yasuda et al. (2018), Yukami et al. (2018), and FRAWeb (http://kokushi.fra.go.jp/H29/H29_75.pdf Accessed 3 Sep 2018). Catch data described by Yatsu et al. (2005) were adopted for periods when catch data were unavailable from the above stock assessment reports. Stomach composition by weight of minke whales in the Northwestern Pacific Ocean, principally off the Sanriku area of Honshu Island and eastern area of Hokkaido Island (Fig. 3), was adopted from Kasamatsu and Tanaka (1992) for 1968–1987, Tamura et al. (1998) for 1994–1995, and Konishi et al. (2009) for 2000–2007. The data of Kasamatsu and Tanaka’s study (1992) during 1950–1965 were excluded as krill and pollock were dominant during this period. In order to estimate recruitment, biomass, and F, tuned virtual population analyses (VPAs) and non-tuned VPAs have been used for Japanese sardine and chub mackerel, and for Japanese anchovy, respectively, and an area-swept method was used to estimate the biomass of Pacific saury (Ueno et al. 2017; Hiramatsu 2018). The assumed natural mortality coefficients (M) are indicated in Table 1. As the biomass of Pacific saury is available only from 2003, the standardized catch per unit effort (CPUE) (ton per fishing operation) of the Japanese stick-held dip net fishery since 1980 was used as a proxy of long-term age-aggregated biomass (FRAWeb: http://kokushi.fra.go.jp/H29/H29_75.pdf Accessed 3 Sep 2018). The AO data were obtained from the National Oceanic and Atmospheric Administration, USA (NOAA) (NOAAWeb: www.cpc.ncep.noaa.gov/products/precip/CWlink/daily_ao_index/monthly.ao.index.b50.current.ascii.table Accessed 20 Sep 2018). The NPGO, NPI, and PDO data were extracted from the JMA (JMAWeb: http://www.data.jma.go.jp/kaiyou/shindan/index.html Accessed 14 Sep 2018). The MOI data were extracted from the JMA (JMAWeb: https://www.data.jma.go.jp/kaiyou/data/db/obs/knowledge/stmw/moi.txt Accessed 31 Oct 2018). The KESA SST data were obtained from Yatsu and Kawabata (2017) until 2014, and thereafter calculated using the COBE SST (JMAWeb: http://ds.data.jma.go.jp/tcc/tcc/products/elnino/cobesst_doc.html Accessed 5 Sep 2018). The global ocean net primary productivity data based on a vertically generalized production model using satellite-derived chlorophyll concentration (Behrenfeld and Falkowski 1997) were obtained from Oregon State University (OSUWeb: http://www.science.oregonstate.edu/ocean.productivity/standard.product.php Accessed 8 Feb 2019). In order to detect phase shifts in biomass and RPS, I examined statistically significant shifts in the mean values of the Regime Shift Index, using Sequential Regime Shift Detection software (version 3.4) developed by Rodionov (2004). The parameters of this software were set as follows: target significance level = 0.1, cut-off length = 7 by considering the shortest period of SST regime (Fig. 2), Huber’s weight = 5, and red-noise estimations = none. For other statistical analyses, R (version 3.3.1) was used. Before conducting pairwise correlation analysis of time-series data, the Shapiro–Wilk test was performed, where the null hypothesis assumed that data followed a normal distribution. If the null hypothesis was not rejected, Pearson’s correlation coefficient was used, otherwise Spearman’s rank correlation coefficient was used. Commercial catch is a function of stock biomass and ER or F, which is a product of the catchability coefficient (q) and fishing effort (Walters and Parma 1996). As the q and fishing effort change with time (Walters and Parma 1996), catch trajectories during this period are incomparable to those in the later decades due to drastic innovations of fishing technologies, which increased the q. Here, stick-held dip nets for Pacific saury during the 1950s (FRAWeb: http://kokushi.fra.go.jp/H29/H29_75.pdf Accessed 3 Sep 2018) and purse seine for chub mackerel since 1964 (Yukami et al. 2018) represent such cases. Because the catches of saury and chub mackerel were artificially low during 1905–1950, only catches of sardine and anchovy were examined. An increase in sardine catch during 1924–1933 was primarily caused by population growth and development of the fisheries, but the major cause of population declines in the 1940s could be attributed to recruitment failures during 1938–1941 associated with unfavorable abiotic environmental conditions such as changes in the Kuroshio path (Figs. 1 and 2; Kawasaki 1983). The anomalies of NPI and PDO drastically changed corresponding to the 1925/26 regime shift, and reversed around the 1944/45 regime shift (Fig. 5; Yasunaka and Hanawa 2002). Although the period 1926–1945 was generally considered favorable for sardine in the Pacific Ocean, recruitment failures occurred a few years before the 1944/45 regime shift (Yatsu and Kawabata 2017). The KESA SST drastically changed from 1940 to 1942, which is almost consistent with years of recruitment failures. However, a negative anomaly of KESA SST began in the late 1910s, prior to the 1925/26 regime shift (Fig. 5). Since the 1920s represented a period of development for the sardine fishery, evaluation of the effects of the 1925/26 regime shift and KESA SST on sardine stocks was difficult. Between 1905 and 1950, the catch trajectory of anchovy showed a pattern opposite to that of sardine (Fig. 2). In summary, species replacement between sardine and anchovy is recognized during this period, and its primary driver is likely the KESA SST. During this period, the commercial catch of sardine was low in contrast to that of anchovy, which was generally consistent with anomalies of the NPI, PDO, and KESA SST (Figs. 2 and 5). However, sardine catch began to increase in the early 1970s due to the occurrence of strong year classes (high recruitments) and low ER in both the Pacific and Tsushima Current stocks (Yatsu et al. 2005; Ohshimo et al. 2009). The recovery of the Pacific stock and Tsushima Current stock is consistent with a negative anomaly of the KESA SST and positive anomaly of the MOI, respectively (Fig. 5). In contrast, the anchovy catch began to decrease in the early 1970s (Fig. 2). The chub mackerel catch gradually increased, owing to fisheries development (Yukami et al. 2018) and population growth in the mid-1960s (Yatsu et al. 2005). The prevalence of chub mackerel in the stomach composition of minke whales during 1968–1976 (Fig. 3) suggests that the biomass of Pacific stock of chub mackerel reached a high level at least by 1968. The Pacific saury catches drastically fluctuated during this period with a peak of 575 thousand tons in 1958 and a trough of 63 thousand tons in 1969; thereafter, the catch recovered to 406 thousand tons in 1973 (Fig. 2), when the catch of Pacific stock of chub mackerel was 639 thousand tons. Pacific saury, however, was not consumed by minke whales, which are opportunistic feeders (Fig. 3; Tamura et al. 1998). Therefore, the high catches of saury in the 1970s may not represent a high biomass. Since the late 1970s, the stock assessment results are available for the target stocks, except for Pacific saury (Figs. 6 and 7). 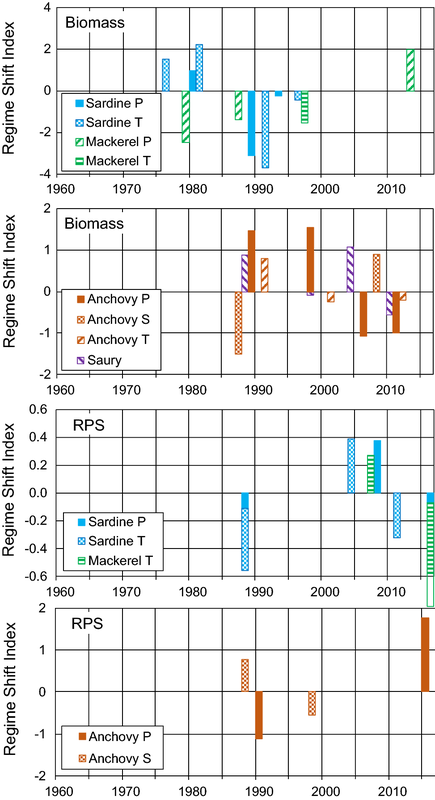 The sardine biomass and catch indicated periods of high stock during the 1980s, depletion in the 2000s, and the initiation of recovery in the 2010s (Figs. 3 and 6). In contrast, the total anchovy catches and biomass of the Pacific and Tsushima Current stocks decreased in the last decade, suggesting a new sardine regime began around 2010. However, recent recoveries of the two stocks of sardine and Pacific stocks of chub mackerel are also considered the results of effective management (see below). In contrast, the cause(s) of decline in anchovy biomass remain unknown, as the stock assessment results are uncertain and the PDO anomaly showed rather short-term variability (Fig. 5). The details of population fluctuations of target stocks are described below, together with their hypothetical mechanisms. The biomass of the Pacific stock of Japanese sardine swiftly increased after the 1976/77 regime shift owing to elevated RPS and reduced ER, until the 1988/89 regime shift (Fig. 6). Fishing effort increased during the 1980s through the construction of large-sized purse seine fleets (Yatsu 2005; Makino 2018). This elevated fishing effort was sustainable as the SSB steadily increased until 1988 (Fig. 7). The 1988/89 regime shift brought about negative anomalies of the PDO and MOI, as well as positive anomalies of the AO and KESA SST, all of which are unfavorable for Japanese sardine. This condition lasted only 3 years for the PDO, 5 years for the AO, and much longer for the KESA SST and MOI (Fig. 5). Watanabe et al. (1995) pointed out that recruitment failures during 1988–1991 (Fig. 7) were natural phenomena, and neither growth overfishing nor recruitment overfishing was responsible. The biomass of Japanese sardine continued to decline and was depleted by the early 2000s, under generally moderate RPS and higher ER or F. Higher F is caused by a higher catchability coefficient (q) and/or greater fishing effort. MacCall (1976) detected an inverse relation between the q and population abundance of California (Pacific) sardine Sardinops sagax caeruleus during 1937–1944. Elevation of q was plausible for the Japanese sardine fisheries in the early 1990s, as the SSB declined sharply from the end of 1980s. The increased fishing effort for this stock during the 1980s caused excessive capitalization after the 1988/89 regime shift, when RPS was reduced dramatically (Fig. 6; Yatsu 2005; Makino 2018). Yatsu and Kawabata (2017) concluded that high F prevented stock recovery, and elevated fishing effort was unsustainable during the late 1990s and 2000s. The PDO anomaly during 2008–2012 was negative and the KESA SST anomaly has been generally positive since 1988. However, high RPS anomalies were observed in 2006, 2008, 2010, and 2015 (Figs. 5 and 6). Although the cause(s) of the high RPS anomalies are unknown, the biomass and catch of this stock began to increase in 2010 owing to elevated RPS and reduced ER. This was considered a combined result of the Resource Recovery Plan and closure of fishing grounds around the Joban area of Honshu Island associated with the 2011 Great East Japan Earthquake (Yukami et al. 2018). In 2003, the Resource Recovery Plan was established for large- and medium-sized purse seine fleets that mainly target sardine, anchovy, and chub mackerel off Northeastern Japan, and their annual fishing days were reduced by 13–40% during 2003–2011, including the scraping of five fishing fleets during 2003–2004 (FAJWeb: http://www.jfa.maff.go.jp/j/suisin/s_kouiki/taiheiyo/pdf/t16-3-6.pdf Accessed 07 Feb 2019). The current SSB is above Blimit (Fig. 7) and the biomass is expected to increase under Fcurrent, if the median of RPS since 1988 continues in the near future (Furuichi et al. 2018). However, as age-0 and age-1 fish currently constitute the major portion of the catch and as full maturation occurs after age-2, it is necessary to improve the current management policy to avoid exerting excessive fishing pressure on immature fish so that sufficient SSB is maintained (Furuichi et al. 2018). Catches by Russia were excluded from the stock assessment (Furuichi et al. 2018), as this amount is negligible (from 10 tons in 2014 to 6,680 tons in 2016; NPFCWeb: https://www.npfc.int/statistics Accessed 19 Oct 2018). The spatial distribution of this stock expanded to Oyashio and offshore area beyond 180°E longitude during the high stock period and shrunk to KOTZ and close to the Japanese Archipelago during the low stock period (Table 1, Furuichi et al. 2018). Somatic growth and the age at maturation were inversely related to stock abundance, indicating a density-dependent effect (Table 1; Yatsu and Kawabata 2017; Furuichi et al. 2018). Several hypothetical mechanisms of population fluctuation have been suggested for this stock, which is one of the most intensively studied stocks in Japan. Noto and Yasuda (1999) discovered that the survival rate in the early life stages is negatively correlated with the KESA SST in February. Yatsu et al. (2008) hypothesized that intensification of the Aleutian Low after the 1976/77 regime shift, i.e., the positive phase of PDO, expanded the major feeding grounds in the Oyashio area, resulting in increased carrying capacity for this stock. In addition, the MLD deepened and the SST decreased around the Kuroshio Extension Current, resulting in improvements in the early survival rate through enhanced primary production and reduced arrival of tropical predators such as skipjack tuna (Yatsu et al. 2008). Nishikawa et al. (2011) found that the winter MLD along the axes of Kuroshio and Kuroshio Extension Currents, where sardine larvae are mainly distributed, positively correlated with the natural logarithm of RPS (LNRPS), and that deepening of winter MLD reduced the SST around the Kuroshio Extension Current and KESA. This is consistent with the findings of Noto and Yasuda (1999). Nishikawa (2018) further confirmed that the SST and MLD during winter and spring in the vicinity of the Kuroshio axis are critical for recruitment regardless of the stock level, which affects the location of major spawning grounds and peak spawning periods. The occurrences of high RPS since the late 2000s are inconsistent with the KESA SST anomalies; however, moderately high RPS in 2015 coincided with a positive PDO year, and positive PDO since 2014 may have contributed to the recovery of biomass (Figs. 5 and 6). Okunishi et al. (2012) constructed an individual-based multi-trophic level ecosystem model for growth and migration of this stock, with model results indicating that the larvae and juveniles under optimum temperature and in high chlorophyll-a areas grow quickly. As a result, recruitments increased in years with a high proportion of these fast-growing individuals, which is consistent with the findings of Takahashi et al. (2008, 2009). Takagi et al. (2013) detected that periods of stable and unstable states of the Kuroshio Extension path (during 2002–2005, and 1996–2001 and 2006–2009, respectively) corresponded to respective occurrences of small- and large-sized juveniles in May. They argued that juveniles were swiftly transported east during the stable path period of the Kuroshio Extension Current, making it difficult for the larvae to reach the productive KOTZ area via the quasi stationary jet (J1 in Fig. 1). This would eventually result in poor recruitments, consistent with the low values of RPS during the early 2000s (Fig. 6). Nakayama et al. (2017) detected statistically significant negative correlations of recruitment of this stock and SST of the Kuroshio, Kuroshio Extension Current, Kuroshio recirculation area, and KESA during winter, spring, and autumn, with the highest Pearson’s correlation coefficient occurring during winter (December-February). Meanwhile, in summer and autumn, significant negatively correlated areas were also present around Hokkaido Island and the broad area from KOTZ to the Kuril Islands. This seasonal and spatial variability in correlation maps approximately coincides with the estimated migration route of age-0 fish (Yukami et al. 2018), suggesting the cumulative effects of regional SST on the recruitment processes. Based on the results of convergence cross-mapping, a method that can detect causality directly, not via correlation, Nakayama et al. (2017) found interspecific interactions between Japanese sardine and Japanese anchovy. They argued that prey competition is a plausible factor in these interactions as diet composition of the larvae of these species strongly overlaps in an area where both the species co-occur (e.g., Takagi et al. 2009). The biomass of the Tsushima Current stock of Japanese sardine continuously increased since the early 1970s owing to generally high RPS and low ER prior to the 1988/89 regime shift (Fig. 6), when RPS drastically declined. Although the RPS anomaly has fluctuated around zero since 1995, the biomass remained low due to a high ER in the late 1990s and 2000s. Ohshimo et al. (2009) examined the cause of the observed inverse relationship between the biomass and ER since the 1960s (Fig. 6), occurring in spite of the high number of available fishing days for large-sized purse seiners during the 1980s, and which decreased during the 1990s. They concluded that although the M was assumed constant at 0.4/year over time, it must have increased during low stock periods, as older (age-2 +) and younger (age-0 and 1) individuals drastically decreased and increased, respectively, in the mid-1990s. This is a challenging hypothesis, as it is generally difficult to estimate the actual M for each age and year. There is another possibility, i.e., an inverse relation between the q and population abundance (MacCall 1976). The biomass began to increase in 2010, when a strong year class occurred, and after ER remained low since 2009. This reduction in ER can be attributed to the implementation of the Resource Recovery Plan in 2009, and its successive plans until the present day, with additional management measures to ensure the conservation of small-sized fish. The current SSB is above Blimit (Fig. 7) and the biomass is expected to increase under Fcurrent, if the median of RPS during 2006–2015 continues in the near future (Yasuda et al. 2018). Given the increasing trend of biomass, it is recommended to continue following the current management framework (Yasuda et al. 2018). However, the results of current VPA may be optimistic for two reasons. First, various stocks in the East China Seas are deteriorating owing to long-term high ER by Japan, China, and South Korea (FRAWeb: http://kokushi.fra.go.jp/H28/H28_65.pdf Accessed 3 Sep 2018). Second, only Japanese catches were used in the tuned VPA, as catches of Japanese sardine by foreign countries remain unconfirmed as representative of this stock (Yasuda et al. 2018). In fact, the Japanese catch in 2014 was extremely low (10 thousand tons) compared with that in 2013 (87 thousand tons) and 2015 (70 thousand tons), and the 95% confidence interval of the estimated biomass of this stock is extremely broad (Hiramatsu 2018). Therefore, the results of VPA are considered unstable. The spatial distribution of this stock expanded to the Northern Japan Sea and Yellow Sea during the high stock period and shrunk to the Southern Japan Sea and East China Sea during the low stock period (Table 1; Yasuda et al. 2018). Somatic growth and the age at maturation were inversely related to stock abundance (Table 1; Yasuda et al. 2018). Ohshimo et al. (2009) showed statistically significant negative and positive correlations between logarithmic residuals of recruitment from the Ricker spawning-recruitment curve (LNRR) and AO in winter (averaged from December to February) and MOI (January–March), respectively, from 1953 to 2006. They suggested a combination of positive anomaly of MOI and negative anomaly of AO, i.e., a cool and windy winter, would increase the biomass of phytoplankton and zooplankton, and subsequently increase the recruitment of this stock. According to Kurota et al. (2018), the trajectory of LNRPS, which shows a similar trend to that of the LNRR, is negatively correlated with that of AO. However, this relationship has become less distinct in recent years. In contrast, the MOI suddenly became positive in 2010, with positive MOI years prevailing thereafter (Fig. 5), which may have contributed to the recent recovery of biomass and catch. Kodama et al. (2018) revealed that the LNRPS of this stock was positively affected by delays in the start and end dates of the spring phytoplankton bloom in the Japan Sea, supporting the temporal match/mismatch hypothesis (Cushing 1990). They also indicated that the delay of the lowest SST period contributed to the delay of the end of the spring bloom during 1998–2015. As the SST of the Japan Sea is negatively correlated with winter MOI, this may be the prevailing driver for this stock in recent decades. The biomass of the Pacific stock of Japanese anchovy increased from the late 1970s to 2003, thereafter gradually decreasing until 2016 (Fig. 6). Meanwhile, the RPS anomalies were generally positive during the 1980s; thereafter, the RPS anomalies fluctuated around zero, except for 2015 when an extremely high RPS was observed. The ER ranged generally from 20 to 40% throughout the available data period. Kamimura et al. (2018) pointed out that the VPA-derived SSB was underestimated during the high stock period, when numerous eggs were produced in the broad area of KOTZ as estimated by egg census surveys. However, commercial fishing was conducted only in the coastal area of KOTZ. This expansion of spatial distribution during the high stock period was also verified by mid-water trawl surveys (Kamimura et al. 2018). The results of the egg census survey, including the KOTZ, indicated that egg production gradually decreased from the maximum (15,623 trillion eggs) in 1999 and second maximum (14,313 trillion eggs) in 2004 to 1725 trillion eggs in 2016, a reduction of 89%. The results of the midwater-trawl surveys since 2003 also indicated a similar decline in abundance. Kamimura et al. (2018) recommended reducing Fcurrent, as the SSB in 2016 (108 thousand tons) was below Blimit (130 thousand tons; Fig. 7), as well as monitoring the relationship between the recruitment and catch of “shirasu”, as the spatial distribution of this stock recently shrank to coastal areas, where “shirasu” fishing has been carried out. The spatial distribution of this stock expanded to Oyashio and offshore area as far east as 170°E longitude during the high stock period and shrunk to KOTZ and close to the Japanese Archipelago during the low stock period (Table 1; Kamimura et al. 2018). Density dependence of somatic growth and maturation have not been reported; however, the spawning grounds expand to high seas and the spawning season extends during the high stock period (Table 1; Kamimura et al. 2018). Nakayama et al. 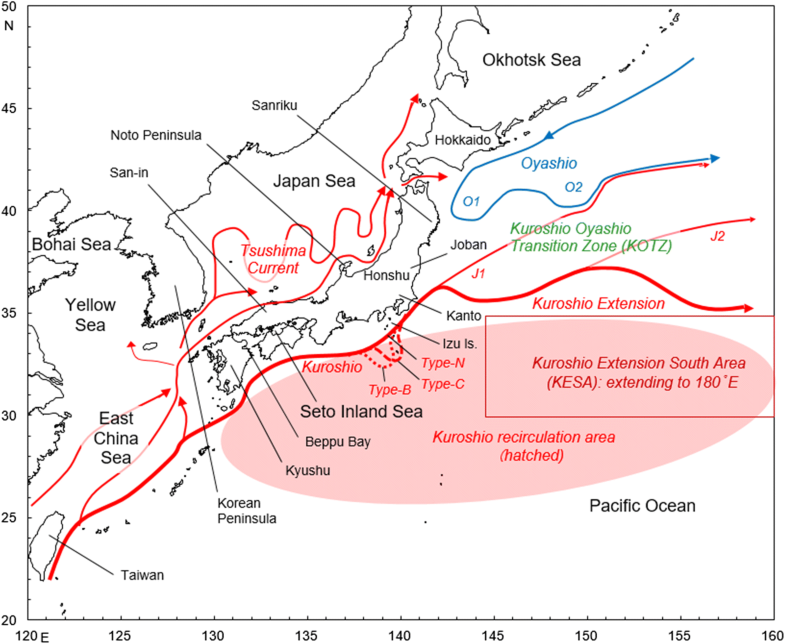 (2017) detected statistically significant positive correlations between the recruitment of this stock and SST of the Kuroshio, Kuroshio Extension Current, and Kuroshio recirculation area throughout the year, with additional positive correlation areas around the KOTZ and Kuril Island from spring to autumn. A strong Pearson’s correlation coefficient was recorded from March to May. This seasonal and spatial variability in correlation maps may reflect the extended spawning season of Japanese anchovy (Table 1). On the basis of the results of convergence cross-mapping, Nakayama et al. (2017) argued that the SST affects recruitment more strongly than age-aggregated abundance and prey compositions could be a plausible cause of detected interspecific interactions between Japanese sardine and anchovy, as noted for the Pacific stock of Japanese sardine. In contrast to the Pacific stock, the Seto Inland Sea stock biomass slightly decreased from the early 1980s to the mid 1990s, thereafter recovering and becoming stable from 2010 onward (Fig. 6). RPS was generally positive during 1984–2002 and became negative from 2003 onward. The ER gradually increased during the 1980s, became stable until 1998; thereafter, it slightly decreased until 2016, with high frequency variability. Given these trajectories of RPS and ER, the decline in biomass from the early 1980s to the mid 1990s may have been caused by a high ER, in spite of the high RPS. Similarly, an increase in biomass during the 2000s may be derived from low ER, in spite of the low RPS. Therefore, the effects of fishing are considered the prevailing driver of this stock, and the sardine-like biomass trajectory pattern of this stock is probably not representative of natural fluctuations. Egg production has generally increased since the end of the 1980s, which is consistent with the VPA-derived SSB trajectory. As the SSB in 2016 (64 thousand tons) is above Blimit (31 thousand tons; Fig. 7) and Fcurrent is stable, it has been recommended that the current SSB level should be sustained (Kohno and Takahashi 2018). The spatial distribution of this stock is generally confined to the Seto Inland Sea, regardless of the stock level. Density dependence of somatic growth, maturation, and extension of spawning season has not been reported (Table 1; Kohno and Takahashi 2018). The biomass trajectory showed the least variability among three stocks of Japanese anchovy, and it increased from 1979 to a peak in 1998. It thereafter gradually decreased until 2016 (Fig. 6). Meanwhile, the RPS anomaly showed high frequency variability, and was generally negative during the 1990s. The ER was the highest among the three stocks of anchovy, and was generally low during the 1990s, 2007, and 2009. Therefore, the VPA results suggest that negative RPS anomalies and low ER increased the biomass, although these results are considered quite uncertain, as noted below. Japanese anchovy is broadly distributed in the Japan Sea, East China Sea, Yellow Sea, and Bohai Sea, but the current VPA used only Japanese catch data obtained from the coastal areas of the Western Japan Sea to the northwestern coast of Kyushu Island (Hayashi et al. 2018). Details of migration are not well known, and commercial catch in South Korea is larger than that in Japan. Thus, these VPA results contain considerable uncertainty. Egg production in the East China Sea and Japan Sea increased from the early 1990s to a peak of 10,084 trillion in 2004 and thereafter decreased to approximately 1345 trillion in 2016, a reduction of 87%, with high frequency variability (Hayashi et al. 2018). This up-and-down trend is similar to the VPA results (Fig. 6). The results of midwater-trawl surveys since 1996 have also indicated a similar decline in abundance during the late 1990s and 2000s. The effects of population abundance on spatial distribution, somatic growth, age at maturation, and extension of spawning season have not been reported (Table 1; Hayashi et al. 2018). Hayashi et al. (2018) recommended reducing Fcurrent, as the SSB in 2016 (66 thousand tons) was below Blimit (91 thousand tons; Fig. 7). Hayashi et al. (2018) also reported a statistically significant positive correlation between the annual recruitment numbers and winter SST of the East China Sea from December to January (31°N–34°N, 126°E–131°E) during 1977–2016. Therefore, it would be advisable to study whether the incorporation of SST data as an explanatory variable improves the performance of HCR for this stock. The biomass of the Pacific stock of chub mackerel drastically decreased from a high level during the 1970s to the end of the 1990s, and then remained low until 2003 (Fig. 6). The cause of the decline from the late 1970s to the 1980s can be attributed to negative RPS anomalies combined with elevated ER (Figs. 6 and 7). During the 1990s, in spite of positive RPS anomalies and strong year classes in 1992 and 1994, the biomass did not recover until 2004, owing to overfishing (Kawai et al. 2002). Also, high frequency variability in RPS was pronounced during the 1990s and 2000s, when the SSB was below Blimit (450 thousand tons; Fig. 7) and the spawners were composed of mostly age-1 and age-2 fish, in contrast to that during the 1970s when age-3 and age-4 fish were the major spawners (Watanabe and Yatsu 2006). The Resource Recovery Plan began in 2003, which decreased the annual fishing effort and ER as noted above, and a strong year class occurred in 2004, resulting in a slight biomass increase. During the 2010s, the ER further decreased, partly due to the closure of fishing grounds off the Joban area of Honshu Island associated with the 2011 Great East Japan Earthquake. A strong year class was produced in 2013, further increasing the biomass (Ichinokawa et al. 2015; Yukami et al. 2018). This success of the Resource Recovery Plan, together with scientific recommendations to avoid harvesting low-price immature fish in winter (Watanabe et al. 2012), promoted fishers to shift from the previous mass catches of immature fish to a cost-effective and high-income fishing strategy. The SSB in 2016 was above Blimit; however, the biomass is expected to decrease if Fcurrent continues (Yukami et al. 2018). In 2014, China began to harvest chub mackerel in the NPFC area, and their reported catch increased from 25 thousand tons in 2014 to 143 thousand tons in 2016, according to the NPFC. Russia harvested this stock until 1988, and then recommenced fishing chub and spotted mackerels in 2014. Their catch increased from 45 tons in 2014 to 9 thousand tons in 2016. Catches by China and Russia are included in the VPA data (Yukami et al. 2018). The spatial distribution of this stock expanded to Oyashio and offshore area beyond 170°E longitude during the high stock period and shrunk to KOTZ and close to the Japanese Archipelago during the low stock period (Table 1; Yukami et al. 2018). Somatic growth was negatively affected by the recruitment level, and environmental conditions and age at maturation were positively related to somatic growth (Table 1; Watanabe and Yatsu 2004, 2006). Recruitment variability of this stock was studied using various statistical models based on the SST in feeding and spawning/nursery grounds, with SSB and its age composition and early growth rates, and biomass of Japanese sardine as the explanatory variables. Watanabe and Yatsu (2004) detected a negative correlation between the fork length of age-0 fish and SST in the KOTZ during April–June from 1970 to 1997, probably owing to feeding conditions associated with variability in the inflow of cool and productive Oyashio waters. Yatsu et al. (2005) proposed an extended Ricker model, in which the LNRPS from 1970 to 2000 was negatively affected by the SSB, biomass of the Pacific stock of sardine, and winter SST around the Northern Izu Islands, the major spawning grounds of this stock. Watanabe and Yatsu (2006) reported that cooler temperatures in feeding grounds accelerated the maturation of older females, whereas warmer temperatures in the spawning grounds accelerated the maturation of age-1 females from 1970 to 1998. Watanabe (2010) pointed out the importance of maternal effects, such as age composition and nutrient conditions of spawners. The spawning period of older females ranges from March to April, earlier than that of younger females. April is considered the most suitable spawning month, as it matches with the spring bloom period. Earlier spawning might reduce the chances of encounter with tropical predators such as skipjack tuna, eventually increasing the early survival rate. Kamimura et al. (2015) found a significant positive correlation between RPS and the growth rate of larvae collected from the KOTZ during May and June from 2002 to 2011. They suggested that the larvae exposed to higher temperatures within a range of 16–22 °C increase their survival rates through enhanced early growth, especially for the cohort hatched in April. This temperature-dependent early growth was supported using rearing experiments by Yoneda (2017). Rearing experiments of adults and larvae of chub mackerel also indicated the following: (1) older females that had previously experienced spawning laid larger eggs than younger females under the same temperature and food conditions, (2) the larvae hatched at lower temperatures were larger than those hatched at higher temperatures, and (3) the larvae hatched from larger eggs showed relatively higher growth rates (Yoneda 2017). On the basis of revised extended Ricker models and particle-tracking experiments, Kaneko et al. 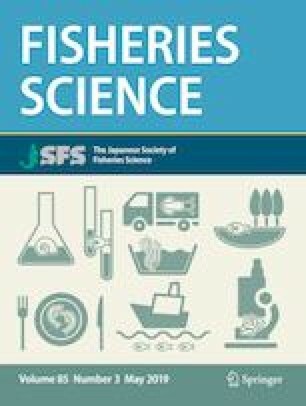 (2018) re-examined the effects of February SST around the Izu Islands on spawners and the effects of SST in spring on the eggs and larvae that were transported downstream of the Kuroshio and Kuroshio Extension during 2001–2012, when predictability of recruitment by the extended Ricker model developed by Yatsu et al. (2005) was drastically reduced. Kaneko et al. (2018) concluded that high RPS years were associated with the Type-N Kuroshio path (Fig. 1), which resulted in low SST in February around the coastal area of Kanto District including the Northern Izu Islands (presumably favorable feeding conditions for spawners), and efficient transport accompanied by subsequent higher SST downstream of Kuroshio and Kuroshio Extension axis in spring, which is favorable for the early growth and survival of larvae. They also noted that low RPS years were associated with the Type-C Kuroshio path, which provides oceanographic conditions opposite to those of the Type-N path for both spawners in winter and eggs and larvae in spring. Finally, the Type-B Kuroshio path provided intermediate environmental conditions. These authors further point out that their results are valid for 2001–2012, when the PDO index and the stability of the Kuroshio Extension were synchronous, indicating that Kuroshio shifted northward during this period. As such, the contribution of explanatory variables is likely subject to changes with oceanic regimes. In summary, (1) temperature may directly and indirectly affect both the maturation and feeding conditions of adults in winter and the growth and survival of larvae in spring, (2) older age composition and good nutrient conditions of spawners are important for higher and stable early survival rates, (3) sardine biomass negatively affected the LNRPS at least during 1970–2000, and (4) contribution of environmental drivers for recruitment changes with ocean regimes. These findings provide an idea of improvement for current management, acknowledging that body size limitation may directly or indirectly contribute to the stability of recruitment and biomass of this stock, which will eventually be of benefit to fishing industry stakeholders. The biomass of the Tsushima Current stock of chub mackerel was stable during the 1970s and the early 1980s at around one million tons, then increased from the early 1990s with a peak in 1996, and thereafter remained at a relatively lower level (Fig. 6). The cause of this biomass trend can be attributed mainly to the increased ER since the mid-1990s, as RPS was stable until the end of the 1980s and increased only slightly thereafter (Fig. 6). Since 1997, the SSB has been below Blimit (250 thousand tons), and the SSB in 2016 was 219 thousand tons. The SSB is expected to slightly decrease if Fcurrent continues at its present trend. Therefore, it is necessary to recover the SSB (Kurota et al. 2018). In particular, the reduction in F of younger fish will ensure stock recovery (Kurota et al. 2018). Although this stock has been harvested by Japan, South Korea, and China, catch data from China are unavailable. Therefore, because the current VPA relies on Japanese and South Korean catches, it is difficult to evaluate the effects of Chinese fishing activities. This is of great concern, as more than several hundred commercial Chinese fleets using fishing lights and various types of gear including tiger nets have been operating in the East China Sea in recent years (Kurota et al. 2018). The effects of population abundance on spatial distribution, somatic growth, and age at maturation have not been reported (Table 1; Kurota et al. 2018). Although environmental conditions are considered to profoundly affect the variability of RPS, a previously detected statistically significant negative relationship between the LNRR and SST of the eastern area of the East China Sea became obscure in recent years (Kurota et al. 2018). The biomass of Pacific saury decreased from 5.0 million tons in 2003, when the subsurface trawling surveys during June-July began, to 1.8 million tons in 2016 (Fig. 6). It further decreased to only 0.8 million tons in 2018 (FRAWeb: http://kokushi.fra.go.jp/H29/H29_75.pdf Accessed 3 Sep 2018). Blimit has not been proposed, as available recruitment and SSB data are limited. Within the trawl survey area, which extends from the southern coast of Hokkaido Island to the Central North Pacific Ocean (approximately 38°N–48°N, 143°E–165°W), the decreasing trend is most prominent in the western area (143°E–162°E). After 2010, Pacific saury almost disappeared from the westernmost area (143°E–155°E, including the Japan’s EEZ) during June and July (Suyama et al. 2016). Similarly, Japanese commercial catch, most of which has been derived from Japan’s EEZ during August-December, declined from a recent peak (355 thousand tons) in 2008 to 114 thousand tons in 2016 (Fig. 1), a 68% reduction. Meanwhile, the total catches of China, Russia, South Korea, and Taiwan, whose fishing grounds are mostly located in the Convention area of NPFC, only slightly decreased from 263 to 240 thousand tons, a 9% reduction, during the same period. In summary, the recent decline in biomass and catch was prominent in the western area including the EEZ of Japan, and the ER increased from 2003 (9%) to 2016 (20%) with high frequency variability (Fig. 6). The CPUE, a proxy of age-aggregated biomass in Japan’s fishing grounds, gradually increased from 1980 to 1994, then decreased until 1999, increased again until 2008, and finally decreased once more, with high frequency variability (Fig. 6). The trends in CPUE and biomass estimated from trawl surveys have been coherent since 2006, but were inconsistent during 2003–2005, with the cause remaining unresolved. The effects of biomass level on spatial distribution may exist as described above, although the available data period is limited. The effects of biomass level on somatic growth and age at maturation have not been reported (Table 1; Suyama et al. 2016). Tian et al. (2003) detected a correlation between the abundance index of large-sized (age-1) saury and ENSO (El Niño-Southern Oscillation) index with a lag of 1 year from 1952 to 2000, but this correlation was not verified by Yatsu and Watanabe (2017), who used CPUE during 1980–2014. Yasuda and Watanabe (2007) found that the abundance index of large-sized saury developed by Tian et al. (2003) was higher when the MLD of KESA in March was shallow, i.e., when the KESA SST was higher, which was opposite to the Pacific stock of Japanese sardine. On the basis of a generalized additive model, Yatsu and Watanabe (2017) reported that the NPGO in winter, KESA SST in February, and recruitment abundance of the Pacific stock of sardine are statistically significant explanatory variables for the CPUE of Pacific saury without time-lag. The NPGO and sardine recruitment showed generally negative effects, and the relationship between the CPUE and February KESA SST anomaly was dome-shaped with a peak CPUE skewed positive toward the SST anomaly. Although a Rossby wave excited by NPGO propagates from the Central North Pacific to the Kuroshio area with a lag of 2–3 years (Di Lorenzo et al. 2013), this lack of lag is consistent with the observed similarity in trajectories of CPUE and those of the relative abundance of Pacific saury estimated by a survey with drift nets in the Central North Pacific Ocean at longitudes of 170°E, 175°E, and 180°E, during June and July of 1979–2006 (Ichii et al. 2018; hereafter called survey-based CPUE). These situations suggest that saury migrate from the Central North Pacific Ocean toward Hokkaido Island during summer, which is consistent with the summer migration patterns assumed by Suyama et al. (2016). On the basis of statistical analyses of year-to-year variability of the survey-based CPUE during 1979–2006, Ichii et al. (2018) suggested that saury recruitment variability was generally driven by winter SST in the Kuroshio Recirculation area (Fig. 1; partly overlapping with KESA), which is a winter spawning and nursery ground of saury, or by spring chlorophyll-a concentration (a proxy of prey for saury larvae) in the KOTZ and Kuroshio Extension (spring spawning and nursery grounds). The correlations between the survey-based CPUE and both winter SST and spring chlorophyll-a concentration were positive (Ichii et al. 2018). The former correlation is consistent with that reported by Yasuda and Watanabe (2007) and partially consistent with that reported by Yatsu and Watanabe (2017). Kuroda and Yokouchi (2017) pointed out that environmental conditions in Japan’s saury fishing grounds show a deteriorating trend, accompanied by decadal-scale variability, in terms of rise in temperature, decrease in the Oyashio transport and chlorophyll-a concentration, and increase in sea surface height and occurrence of warm core rings in the KOTZ. In summary, the positive effect of SST in the Kuroshio Recirculation area and KESA in winter is the most plausible predictor of Pacific saury stock. The positive effects of chlorophyll-a concentration in spring are also biologically reasonable, and the negative effect of recruitment abundance of the Pacific stock of sardine may imply biological competition between the two species. In contrast, there has been considerable concern for the observed increasing trend in the ER since 2003, which has coincided with decreasing trends in the biomass and CPUE under deteriorating environmental conditions in Japanese fishing grounds. Table 4 summarizes the sample size (number of years), mean, and coefficient of variation (CV) of biomass or CPUE, RPS, and ER for each target stock, during 1970–2016 (Fig. 6). Among the target species, the mean biomass was the highest for sardine, followed by chub mackerel. Within each target species, the mean biomass and its CV were higher for the Pacific stocks than for the Tsushima Current stocks, except for the CV of sardine, which was similar between the two stocks. Within each target species, the CV of RPS and ER was also higher for the Pacific stocks, except the ER of sardine. These higher CVs of RPS and ER for the Pacific stocks of anchovy and chub mackerel probably resulted in the higher CV of biomass for the Pacific stocks of these species. The causes of these inter-stock differences in the variability of biomass and its CV, as well as the presence/absence of effects of stock level on biological traits in sardine, anchovy, and chub mackerel were examined, with the exception of anchovy stock in the Seto Inland Sea, as its earlier stage of recruitment is unsuitable for comparisons (Table 1). In sardine, the CV of biomass, and the mean and CV of RPS and ER were similar in the two stocks. However, the mean biomass was higher and the recent biomass recovery was more prominent in the Pacific stock (Table 4, Fig. 6). The spatial distribution, somatic growth, and maturation at age were affected by the stock level in both stocks (Table 1). 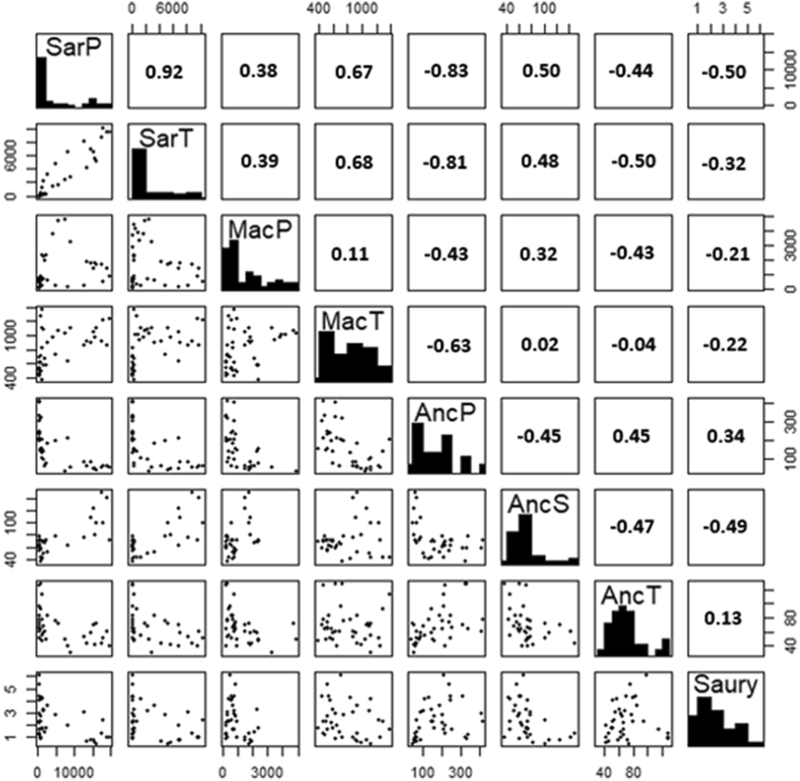 Additionally, relationships between the SSB and recruitments of the two stocks of sardine were nearly coherent (Fig. 7). Therefore, their population dynamics were similar to each other, despite the larger uncertainties in the VPA results in the Tsushima Current stock (Hiramatsu 2018; Yasuda et al. 2018). The higher sardine biomass in the Pacific stock may reflect broader spatial distribution than that of the Tsushima Current stock, when the population level was high, and extended period of high net primary productivity of Oyashio from spring to summer, both of which are common reasons for chub mackerel and anchovy (Tables 1 and 3; Schwartzlose et al. 1999). The higher biomass of the two stocks of Japanese sardines compared with that of the other target SPF may also be derived from the utilization of diatoms as their prey with sardine’s fine gill rakers or filters (Kawasaki 1983; Checkley et al. 2017) and/or Japanese sardine flourishing during the positive phases of PDO and MOI, when ocean productivity around Japan was enhanced by cooler and windy conditions in the subtropical areas in winter and by a southward expansion of productive subarctic waters including Oyashio (Yatsu et al. 2008; Ohshimo et al. 2009). Although the trophic level of chub mackerel is higher than that of sardine and anchovy, its mean biomass is intermediate between sardine and anchovy in both stocks (Table 4). As the temperature optima of chub mackerel was intermediate between that of sardine and anchovy (Takasuka et al. 2008a), the productivity of an ocean regime when chub mackerel dominated may also be intermediate, although the predation of anchovy by chub mackerel would negatively affect the biomass of anchovy. In Japanese anchovy, the biomass was higher in the Pacific stock, whereas RPS and ER were higher in the Tsushima Current stock. As the VPA results of the two stocks of anchovy were quite uncertain, as noted above, the broader area of spatial distribution and higher net primary productivity in Oyashio in summer (Table 3) should be considered potential causes of higher biomass in the Pacific stock. In chub mackerel, the mean RPS was higher and the ER was lower in the Pacific stock than those in the Tsushima Current stock. These are reasonable explanations for the higher mean biomass of the Pacific stock in addition to the broader spatial distribution and extended high net primary productivity period in Oyashio (Table 3). The cause(s) of the observed higher CV of RPS and ER in anchovy and chub mackerel in the Pacific stocks remain unknown. The effects of stock level on biological traits is common among the Pacific stocks of anchovy and chub mackerel. In summary, broader spatial distribution of the Pacific stocks of sardine, anchovy, and chub mackerel than the Tsushima Current stocks and higher net primary productivity in Oyashio extending from spring to summer with high seasonal variability can be considered the main reasons for higher biomass and its variability and the subsequent changes in biological traits of the Pacific stocks. Different mean biomasses of sardine, chub mackerel, and anchovy may be derived from their feeding habits and ocean productivity, which was highest in the sardine regime, followed by chub mackerel and anchovy regimes. According to the Regime Shift Index applied to the trajectories of biomass and RPS (Fig. 8), there were some years when statistically significant shifts were detected generally but did not necessarily coincide between the Pacific and Tsushima Current stocks of Japanese sardine and Japanese anchovy. Positive shifts around 1980 occurred in the biomass of both sardine stocks, and negative shifts occurred around 1990 in both the biomass and RPS of these stocks. This is in contrast to the positive shifts in the biomass of anchovy around 1990, with the exception of the Seto Inland Sea stock, whose biomass trajectory was considered to be primarily due to fishing, as noted above. Around 1980 and 1990, the Pacific stock of chub mackerel showed negative shifts in its biomass. These years are close to the 1976/77 and 1988/89 regime shifts (Fig. 5; Yasunaka and Hanawa 2002). After the late 1990s, some statistically significant shifts were observed around the 1998/99 regime shift. There were other years of significant shifts, which varied with stocks. For example, in 2008, a positive shift occurred in RPS of the Pacific stock sardine, and in 2013 a positive shift occurred in the biomass of the Pacific stock of chub mackerel, which corresponded to the occurrence of the 2013 strong year class (Yukami et al. 2018). These sporadic occurrences of significant shifts in sardine and chub mackerel since 2000 may have been derived from stochastic variability, owing to the depleted SSB (< Blimit) (Fig. 7) and its simplified age composition during this period, as well as a similar situation in the Pacific stock of anchovy since the 2010s. Additionally, unstable PDO anomalies since the 1998/99 regime shift may be responsible for these phenomena (Fig. 5). Concentrations of significant shifts around 1990 suggest that the effects of the 1988/89 regime shift were more influential on the target stocks than those of the 1976/77 and 1998/99 regime shifts during the available data period. Notably, delayed responses in biomass shifts in sardine are likely due to its longevity (Table 1). According to the Shapiro–Wilk test for the trajectories of biomass and CPUE, the null hypothesis (data follows a normal distribution) was rejected in all target stocks at a significance level of 5%. Histograms of data frequency are more or less skewed (Fig. 9). Therefore, Spearman’s rank correlation coefficient was used for pairwise comparisons of trajectories of biomass and CPUE (Fig. 9). The strongest positive correlation was detected between the two stocks of sardine, and strong negative correlations were detected between the Pacific stock of anchovy and the two stocks of sardine. Moderate negative correlations were detected between the Tsushima Current stock of anchovy and the two stocks of sardine. Thus, the traditional sardine/anchovy cycle was confirmed, except for the Seto Inland Sea stock (Fig. 6), whose biomass trajectory has been considered primarily driven by fishing, as previously noted. There were moderate and weak positive correlations between the two stocks of sardine and the Tsushima Current stock and the Pacific stock of chub mackerel, respectively. Contrastingly, moderate negative correlations were detected between the Pacific stock of anchovy and the two stocks of chub mackerel. A moderate negative correlation between the Pacific stock of sardine and saury was observed, which is similar to the results in the Tsushima Current area (Gong and Suh 2012). In order to evaluate the above retrospective analyses, it is necessary to understand their underlying mechanisms, which will be briefly discussed in this section. Houde (2008) reviewed the mechanisms of recruitment variability and concluded that it can result from numerous processes operating at different time and space scales, representing an integrated process acting throughout pre-recruitment life. These processes included physical factors such as temperature, and biological factors such as prey, predators, early growth, and maternal effects, as well as regulation via density-dependent growth and mortality. Takasuka (2018) summarized three principal mechanisms as amplifiers of subtle environmental changes leading to large fluctuations in the recruitment of SPF. First, the “bigger is better” hypothesis assumes the advantages of large size or fast early growth for initial survival. Second, the “stage duration” hypothesis assumes the early mortality rates increase with the duration of early life stages. Third, the “growth-selective” hypothesis assumes slower-growing individuals are more vulnerable to predation, even individuals of the same size. The “bigger is better” and “growth-selective” hypotheses, however, likely do not apply for voracious and large predators such as tunas. As they are sufficiently large and quick, subtle advantages of larvae and juveniles of SPF will be irrelevant, as evidenced by predation of larvae of Japanese anchovy by skipjack tuna (Takasuka et al. 2004). Interestingly, skipjack tuna preyed on larger anchovy larvae, which may be due to the advantage of more energy gain for a given effort in skipjack tuna (Takasuka et al. 2004). Kodama et al. (2018) suggested that the match/mismatch of spawning season of the Tsushima Current stock of sardine and spring blooming, associated with winter SST, in the Japan Sea determines the recruitment success or failure of this stock. Takasuka et al. (2008a) proposed the “optimum temperature” hypothesis as a mechanism of species replacements on the basis of long-term eggs and larvae census surveys around the Kuroshio Current area, where sampling efforts tend to be more intensive from winter to spring. According to this data, sardine and chub mackerel exhibited steeply peaked patterns with marked maxima at approximately 16 °C and 18 °C SST, respectively, whereas anchovy exhibited a plateau-like SST pattern with a peak at approximately 22 °C. These temperature optima matched the observed sequence of species replacements and inter-stock correlation analyses on biomass (Figs. 2 and 9). Takahashi et al. (2009) proposed a mechanistic hypothesis for alternations in the Pacific stocks of Japanese sardine and Japanese anchovy, through contrasting responses in their early growth and survival processes to wind-forced oscillations of the KOTZ current structures and subsequent changes in temperature and prey conditions. Temperature may directly and indirectly affect the recruitment processes, and the potential mediators are physiology, early growth of target species, and food availability, coupled with MLD (Nakayama et al. 2017). With respect to a weak positive correlation between the Pacific stocks of sardine and chub mackerel (Fig. 9), correlation maps between the trajectories of winter SST and LNRR of the Pacific stocks of sardine and chub mackerel indicated similar positive correlation areas: the KESA in sardine and the Kuroshio Recirculation area in chub mackerel (Yatsu et al. 2005). This similarity in correlation maps is consistent with the steeply peaked pattern with a slight difference in the SST optima (approximately 16 °C vs 18 °C) between the two stocks (Takasuka et al. 2008a), as the average SST (1981–2010) in the Kuroshio recirculation area is slightly warmer than that of the KESA area in winter (JMAWeb: http://www.data.jma.go.jp/kaiyou/data/db/kaikyo/monthly/sst_HQ.html Accessed 7 Nov 2018). Although the cause(s) of moderate positive correlation in the Tsushima Current stocks of sardine and chub mackerel remain unresolved, their optimum SSTs may be closer than those of the Pacific stocks. The observed negative correlation between the Pacific stock of sardine and CPUE of saury is probably the result of differences in the optimum warmer winter SST in the Kuroshio Recirculation area for saury and cooler February KESA SST for sardine (Noto and Yasuda 1999; Yasuda and Watanabe 2007; Ichii et al. 2018; Nishikawa 2018). However, the underlying mechanism of a generally negative effect of sardine recruitment and generally positive effects of NPGO on Pacific saury CPUE (Yatsu and Watanabe 2017) remains unknown. Although all the above mechanisms implicitly assume the same quality of eggs and larvae, maternal effects have recently been recognized as important, as described here for the Pacific stock of chub mackerel, and by Houde (2008). Additionally, biological competition has been detected between the Pacific stocks of Japanese sardine and Japanese anchovy (Nakayama et al. 2017). Matsuda et al. (1992) argued that interspecies competitions are plausible among sardine, anchovy, and chub mackerel around Japan. For example, in the 1970s, the feeding grounds of chub mackerel relocated from coastal areas to offshore, and sardines became more widely distributed in coastal areas as a replacement. This hypothesis is supported by the observed negative effects of biomass and recruitment abundance of the Pacific stock of sardine on the LNRPS of the Pacific stock of chub mackerel and CPUE of Pacific saury, respectively (Yatsu et al. 2005; Yatsu and Watanabe 2017). The “school trap” hypothesis (Bakun and Cury 1999), explains the potential disadvantages of less abundant species in mixed schools containing two or more SPF, since individuals of the less abundant species follow the migration of the dominant species. Interspecies interactions including the “school trap” mechanism may stabilize or promote species replacements once they are triggered by changes in the environment (Matsuda et al. 1992; Nakayama et al. 2017). Lastly, it must be noted that in addition to these deterministic mechanisms, high frequency stochastic factors, such as contact with prey affected by water turbulence and predation associated with mesoscale oceanographic features (for example, eddies and meanderings), also play important roles in recruitment variability (Bailey et al. 2005). As these hypotheses are not mutually exclusive, comparative studies are needed among different ecosystems and among ocean regimes to define the relative importance of these hypotheses in the target ecosystem (Kaneko et al. 2018; Takasuka 2018). The ecosystem effects of the 1988/89 regime shift, including warming of the SST around Japan, shallowing MLD that brought about poor productivity in the Kuroshio (subtropical) area, and a northward retreat of the productive Oyashio (Yatsu et al. 2008), occurred abruptly, and investments on high-capacity fishing fleets during the 1980s resulted in overcapitalization during the 1990s and 2000s (Yatsu 2005; Makino 2018). As a result, overfishing of the Pacific stocks of Japanese sardine and chub mackerel during these decades was caused by a mismatch between economic and ecological scales of variability. This mismatch in the longevity of fishing fleets vs high productivity regimes is a fundamental problem for sustainable fishing (Barange et al. 2009). Fleets expand following increasing trends in fish biomass, usually sometime after the start of a new high productivity regime, but the length of this regime is generally shorter than the life span of the new fishing fleets. This leads to overcapacity at the start of a subsequent low productivity regime (Barange et al. 2009). Heavy fishing may also induce high-frequency stochastic variability of populations (Lindegren et al. 2013), which would increase year-to-year variability in catches. Lastly, it is important to note that regimes are not characterized by only two possible states, and a regime shift does not necessarily imply a shift back to a previously observed state (King 2005). As sustainable exploitation rates are dependent on both regime and stock productivity, there is a strong need to explore appropriate HCR in order to cope with regime shifts. As such, King (2005) suggested that the most appropriate approach to managing fisheries under scenarios of productivity cycles is through the application of regime-specific harvest rates (RSHR). The application of new harvest rates can be delayed by some years after regime shift without affecting the outcomes, making the forecast of the exact regime shift year unnecessary (MacCall 2002). Katsukawa and Matsuda (2003) suggested a management procedure based on non-parametric target switching, or prohibiting catch of the most depleted species in favor of alternating species. This would bring more long-term yield and stable biomass than those obtained from a single-species management. However, Barange et al. (2009) pointed out that different commercial values of the target stocks and the relationship between value and volume require further investigation before target switching could be successfully applied. Based on the population dynamic models of three hypothetical life-history strategists, Walters and Parma (1996) compared the performance (total long-term harvest) of RSHR and constant harvest rate strategy (CHRS) under high and low regimes on carrying capacity. They concluded that the CHRS is likely to produce long-term harvests that are very close (within 15%) to the theoretical optimal performance that would be possible if all future environmental changes were known today. They also suggested that much lower performance of CHRS can be expected only in cases of extremely productive stocks with very high optimal harvest rates and with recruitments that are strongly influenced by uncorrelated environmental effects. Similarly, on the basis of simulation experiments of a sardine-like stock, Harada and Nishiyama (2005) argued that CHRS, such as Fmsy with a precautionary approach, are preferable over optimal RSHR that was assumed to have accurate information on regime shifts in the future. This was because the CHRS is robust for estimating errors in stock abundance, and the resulting long-term catch is slightly smaller than that of the RSHR. In addition, the CHRS is essentially constant for investment, and thus can avoid the overcapitalization described above. The CHRS also brings less year-to-year variation in catch and biomass than that by RSHR, and may therefore be more preferable for fishers and fishing communities. The performance of CHRS can be improved by incorporating catch prohibition of immature fish (Harada and Nishiyama 2005). Although the performance of RSHS was evaluated under the assumption that accurate information in the future is available, in both the studies, this assumption is unrealistic because regime shifts are not mere reversals to previous states (King 2005). Therefore, the potential performance of RSHR is overestimated. It is also important to understand mechanisms of ecosystem dynamics corresponding to regime shifts and to disseminate potential mechanisms for stakeholders, in order to build consensus on fisheries management and to build more realistic population dynamic models for evaluating HCRs. Biological traits are also important for stock management. For example, Ogawa and Hiramatsu (2015) compared the biological traits, age-composition of catches, and stock management between the Pacific stock of chub mackerel and the Atlantic mackerel Scomber scombrus, in order to examine the cause(s) of different age-compositions and management effects. As described above, overfishing of chub mackerel during the 1990s and 2000s simplified age-composition, and only young females contributed to reproduction. This is in contrast to the older age-composition and stable annual catches of Atlantic mackerel, specifically in Norwegian waters, whose fisheries management, relying on the individual vessel quota system, is often regarded as a “success story” in Japan. Ogawa and Hiramatsu (2015), however, concluded that the difference in age composition between the two stocks was partly caused by different biological traits. As chub mackerel grow faster and die younger (M = 0.4/year) than Atlantic mackerel (M = 0.15/year), a yield-per-recruitment analysis suggests the desirable age of first capture of chub mackerel is 2–3 years younger than Atlantic mackerel. On the contrary, the recommended F is higher for chub mackerel and the actual catch is below ABC, which has been exactly adopted as TAC in recent years, contrasting the recent situation in Norway where the actual catch exceeded ABC. Furthermore, it is impossible to apply the selectivity of Atlantic mackerel to chub mackerel, due to the differences in biological traits described above. Thus, it is difficult to evaluate different HCRs and management practices between Japan and Norway. As such, species-specific biological traits largely affect the stock assessment results and fishing strategies, even within the same genus. The maximal biomass and catch among sardines and anchovies differed by region and by species within a region (Table 5; Checkley et al. 2017; Oozeki et al. 2018; N.B. : different species/subspecies by region). The maximal biomass of anchovy was higher than that of sardine in the Humboldt Current and Argentina-Brazil region, whereas sardines dominated the Northwestern Pacific Ocean, California Current and Southern Africa (Benguela Current). The maximum catch was recorded for anchovy in the Humboldt Current, followed by sardine in the Northwestern Pacific Ocean. Meanwhile, the maximum biomass of Japanese sardine was slightly higher than that of anchovy in the Humboldt Current, although this may have been derived from different stock assessment methods (Yatsu and Kawabata 2017; Oozeki et al. 2018). As trajectories of commercial catch and SSB of anchovies and sardines in the Humboldt and Kuroshio–Oyashio Currents are in-phase (Barange et al. 2009; Yatsu and Kawabata 2017), Japanese sardine may potentially compensate for fish meal and fish oil production when the biomass of Humboldt anchovy is low. In the 21st century, the PDO pattern is likely to continue, but the first EOF is a uniform and single-signed spatial pattern with upward linear trends of SST over the North Pacific Ocean (Overland and Wang 2007). Future temperature rise and wind conditions in the Kuroshio and Oyashio areas will change hydrography and reduce vertical mixing in surface waters during winter, resulting in shallowing of MLD and variably affecting the primary productivity of the Kuroshio and Oyashio areas (Chiba et al. 2008; Yatsu et al. 2013; Checkley et al. 2017). 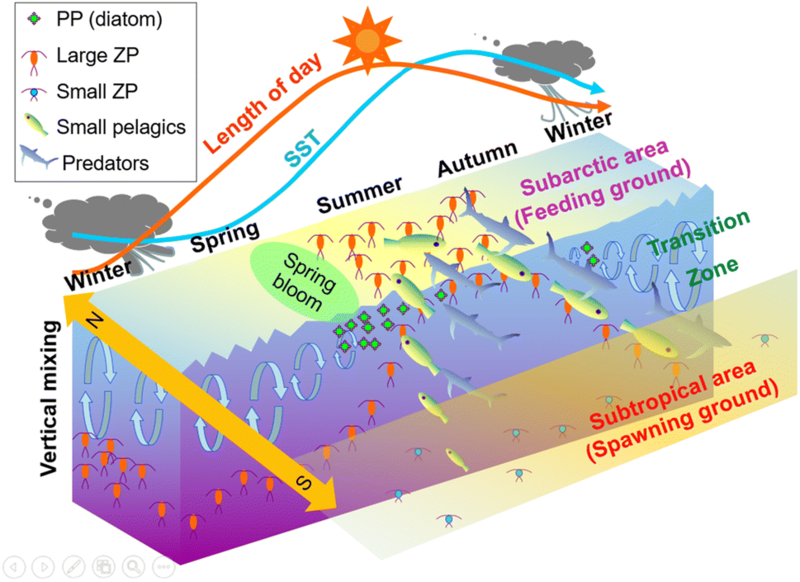 As the primary productivity is limited by nutrient supply through vertical mixing in the Kuroshio area, it is likely to deteriorate as observed in tropical/subtropical areas during recent decades (Polovina et al. 2008). In contrast, in the Oyashio area, as light availability (stratification of water column) is a limiting factor of primary productivity in spring, the primary productivity will increase through enhanced stratification, as long as sufficient nutrients are available in the photic layer. In addition, the spring bloom in the Kuroshio, Oyashio, and KOTZ areas will occur earlier due to earlier stratification. These changes in the primary productivity and earlier spring bloom, together with changes in species composition owing to different species-specific responses in spatial distributions to climate change and ocean acidification, will profoundly affect the early survival rate of SPF. Moreover, diatoms and other larger-sized phytoplankton are projected to display more precipitous decline in abundance than other types of phytoplankton, suggesting negative and variable implications for sardine and anchovy, owing to their feeding habits (Checkley et al. 2017). Therefore, potential overfishing coupled with the effects of climate change is of great concern for food security, production of fish meal and fish oil, and conservation of marine ecosystems, and will affect the sustainable use of SPF. Therefore, managers of SPF are recommended to account for SPF adapting to the potential effects of climate change. This might take the form of conservation of biodiversity and expansion of marine protected areas, in addition to traditional fisheries management measures. By reviewing methods and assessing stock usage of world’s principal SPF, Barange et al. (2009) concluded the following: (1) the most effective monitoring programs are based on fishery-independent surveys that provide precise information of the state of the stocks, and (2) catches-at-age analysis based on VPA-like assessments offer little value, given the poor VPA convergence for SPF and the poor prognosis of subsequent evolution of the population they can provide. The implementation of fisheries management is a synergy of monitoring, modeling, and prediction (Aoki et al. 2018). In Japan, observational networks for fisheries and oceanography have been long established by national and prefectural institutes, providing a valuable database for monitoring and responding to uncertainty in changing ecosystems, as well as for “feedback control” in fisheries management (Aoki et al. 2018). Given the uncertainties in Japan’s current stock assessment (Hiramatsu 2018) and future scenarios including implementation of management measures for SPF, Japanese fisheries scientists are currently trying to apply the management strategy evaluation (MSE) framework to evaluate the performance of HCRs and management procedures using operating models (Ohshimo and Yamakawa 2018; Yamakawa et al. 2018). The introduction of precautionary approaches and body-size limitations for sardine and chub mackerel, with the exception of the whitebait fishery, is required, as previously described. The effectiveness of these measures must also be examined by means of the MSE framework. Acoustic fish finders or echo sounders that provide size frequency distribution of potential target schools of SPF are useful tools for fishers to avoid catching small individuals. The development of the MSE framework with operating models can also be used to evaluate the performance of stock assessment methods (Hiramatsu 2018). The co-management concept is essential for Japan’s fisheries management (Makino 2018). A social–ecological approach for fisheries management would force us to look more into the interactions between the natural and human components of the ecosystems (Makino 2018). This approach is consistent with the ecosystem approach to fisheries (EAF), which strives to balance diverse societal objectives, by taking account of the knowledge and uncertainties about biotic, abiotic, and human components of ecosystems and their interactions, and by applying an integrated approach to fisheries within ecologically meaningful boundaries (Garcia et al. 2003). As such, we need to understand the structure and functions of ecosystems and effects of human activities on ecosystem dynamics, where SPF are distributed. From the viewpoint of EAF, a uniform application of MSY as a target of management is undesirable, as it eliminates various potential management objectives and hence may make co-management difficult. SPF around Japan are actually or potentially harvested by China, North Korea, Russia, South Korea, and Taiwan. Thus, it is absolutely necessary to establish an international framework for stock assessment and management. Responding to this demand, the NPFC formally commenced in 2015. Given the current lack of knowledge of population structure and insufficient catch statistics of SPF in the Japan Sea, East China Sea, and Yellow Sea, a new international fisheries management framework is required for these marginal seas. Catch and biomass data of SPF around Japan indicate decadal-scale variability, generally but not always associated with regime shifts including species replacements since the 1900s. Overfishing during the 1990s and early 2000s prevented the recovery of the Pacific stocks of sardine and chub mackerel. However, these stocks have been recovering since the mid-2000s, owing to the occurrence of strong year classes and reduced ER. The fundamental cause of the above overfishing was due to a mismatch between investments and the use of larger purse seine fleets during the 1980s, when Japanese sardine flourished, and deterioration in ocean productivity around Japan after the 1988 regime shift. This was accompanied by a shift in the dominant SPF from sardine to anchovy. In the face of climate change, and naturally and drastically changing SPF around Japan subject to international fishing pressures, the following four recommendations for their management around Japan are proposed: (1) improve HCRs and stock assessment methods including fishery-independent monitoring by means of MSE and operating models, (2) collate mechanisms of population dynamics among stock/species and changes in ecosystems in order to create more realistic operating models, (3) conserve marine biodiversity in order to help SPF adapt to the potential effects of climate change, and (4) establish an international framework for stock assessment and management in the Japan Sea, East China Sea, and Yellow Sea. These policies will help ensure sustainable SPF fisheries in the future. I thank the FAJ, FRA, and fisheries-oriented local government institutes for their effort in collecting various data and improving stock assessment and management of the target stocks used in this review. I also thank Prof. Satoshi Katayama of Tohoku University for his encouragement, Editage (www.editage.jp) for English language editing, and two anonymous reviewers, who kindly provided valuable suggestions for improving the earlier versions of the manuscript. The publication of this article was supported by the Japan Society for the Promotion of Science in a Grant-in-Aid for Publication of Scientific Research Results (JSPS KAKENHI Grant Number JP 262003).